Add channels and adjust rate to match the audio sampling frequency. This example shows how to set up continuous audio generation using multiple audio channels in a session. The signal, a sample of Handel's "Hallelujah Chorus" is broken up into contiguous segments and played back in two parts. The first part of the example plays each segment on a single speaker and a sub-woofer. The second part plays each segment on a different set of speakers (a choir of voices). % Create a data acquisition session using |directSound| as the vendor ID. % DirectSound sound cards are available on all windows platforms. Will run for 1 second (44100 scans) at 44100 scans/second. No data queued. Will run at 8192 scans/second. Visually Identify audio segments that correspond to each "Hallelujah" in the chorus and select samples numbers at which these segments start and stop. 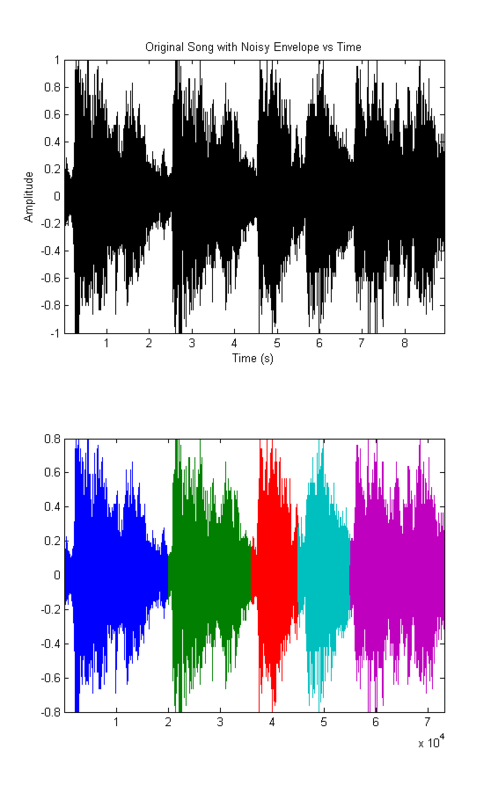 Each color in the plot corresponds to a different segment of the chorus. Visually identify the segment boundaries and mark them. Set up a selection of speakers named speakerselection to play five segments of "Hallelujah" on six different speakers. Each speaker selection specifies which speakers from the 5.1 channel Speaker system shall play each audio segment (these assignments may vary for your speaker system). For the first part of the example, we use single speakers paired with the sub-woofer (4). Start the session to generate data on single speakers in a sequence and pause between the two examples. Start the session to generate data on groups of speakers in a sequence.